Capacitors are filtering devices with are used abundantly in electronic circuits and applications. There are many different types of capacitors. We will discuss some of them in this article. 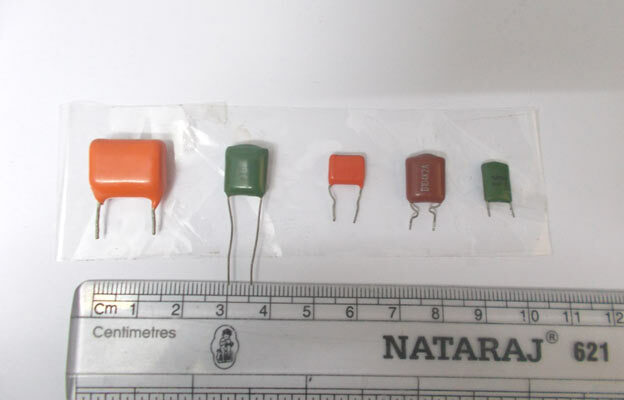 The above image shows the Electrolytic type capacitors, these are used abundantly in all electronic circuits. As shown in figure, they are available in different sizes and colors. But they all do the same function. An electrolytic capacitor contains a dielectric material inside; this material has a break down voltage. This voltage is represented on label. This is the maximum operating voltage for that capacitor. If any voltage higher than labeled voltage applied across that capacitor, it gets damaged permanently. For a higher voltage the dielectric material breaks down. Electrolytic capacitor has a limit for is environmental temperature. This means it cannot be operated or stored at temperatures higher than labeled. If happened, the device will be damaged permanently. The above image shows high capacitance medium voltage electrolytic capacitors. These type of capacitors are dangerous to touch at terminals until discharged completely. If discharge is not done completely, they can deliver a lethal shock. Under no circumstances these should be touched until discharged completely. Electrolytic capacitor has polarity. As shown in figure, the negative terminal of a electrolytic capacitor is marked. This polarity must be followed and the capacitor should be connected accordingly. Otherwise the capacitor will be damaged permanently. With this polarity one can conclude, the electrolytic capacitors are for DC power only. These are not to be used in AC power applications. The above image shows ceramic types of capacitors. These are mainly used for noise suppression and filtering purposes. The capacitance value of these capacitors is labeled by code and is always mentioned in pico Farad. The capacitance of ceramic capacitors can be calculated with this ceramic capacitor value calculator . Ceramic type capacitors have no polarity and so these can be connected in any way. These can be operated in both AC circuit and DC circuits. These are POLYSTER types of capacitors; they are available in low capacitances only. But the operating voltages for these capacitors are high. The capacitances for these capacitors are found the same way as ceramic type capacitors. And these are also mentioned in pico Farad. Polyester type capacitors have no polarity and so these can be connected in any way. These can be operated in both AC circuit and DC circuits. The figure shows high voltage polyester type capacitors. They have low capacitance but very high breakdown voltage. These capacitors have no polarity and can be operated any way. Unlike electrolytic, the tantalum capacitor positive terminal is marked instead of negative. The picture shows SMD type capacitors; they have values up to 10µF. Some of them are polarized. The positive terminal for the polarized ones is marked. These are seen in embedded circuits. SMD capacitors are manufactured in stripes as shown in figure. These are placed on PCB by pick and place machine. thank you, It's realy helpful. Tanks, thats what i am looking for!